It’s a winter wonderland in Flagstaff, powder collecting on the mountain at Snowbowl as they gear up for their big opening day for skiers. Lifts and trails scheduled to open Friday November 16, 2018. For more information about season passes visit their website. Brian Head is hoping to be the first to welcome skiers and snowboarders in Utah next Friday. Skiiers will be making the trek to Snowbasin, Park City and Alta the following weekend of the 23rd. Ski travelers can hit the slopes already at Colorado resorts such as Loveland and Arapahoe Basin and Wolf Creek opened at the end of October, Lookout Pass in Idaho also opened lifts at the end of last month..
Breckinridge, Winter Park and Vail lifts in Colorado as well as Montana resorts Great Divide and Lost Trail-Powder Mountain have already begun rolling lifts to enjoy the packed powder. 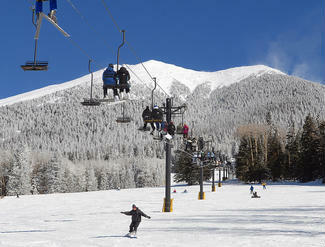 Click here for more information about ski resort opening dates across the country.